Egyptian President Abdel-Fattah El-Sisi said on Monday that the Egyptian state would not allow the nation to be hit by a water shortage, pointing to steps taken to protect water resources and ensure they are properly managed. El-Sisi made the comments as he announced the construction of Egypt's biggest water treatment and desalination project, costing almost LE70 billion. "We won't allow a water-shortage crisis to occur in Egypt. We have not only to keep our share of the Nile, but but also to use our share to the maximum," he said during a short statement. "Egypt is currently carrying out the biggest water treatment and desalination project, just in case of any circumstances concerning the sharing of water." 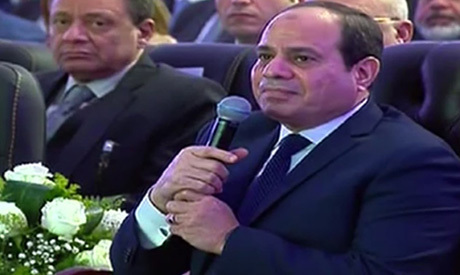 The water treatment and desalination project was highlighted by El-Sisi at the inauguration of several national transportation and residential projects in Cairo's 10th of Ramadan Cty. "This is not for luxury but to resolve a possible situation," he said, adding that he did not want to elaborate more. Egypt has expressed concerns over Ethiopia's Grand Ethiopian Renaissance Dam (GERD) project, saying it will affect Egypt's share of Nile River water, a claim rejected by Ethiopia. Egypt, Ethiopia and Sudan have been involved in talks for the past three years concerning the dam and its effect on the downstream countries. The Nile River is the main source of fresh water in Egypt. El-Sisi said that the government started implementing the water treatment and desalination project three months ago. "This is our country, and water for agriculture and drinking must be secured for citizens from Aswan to Alexandria, so that no problem will occur later and we say that we are not ready for it," he added.